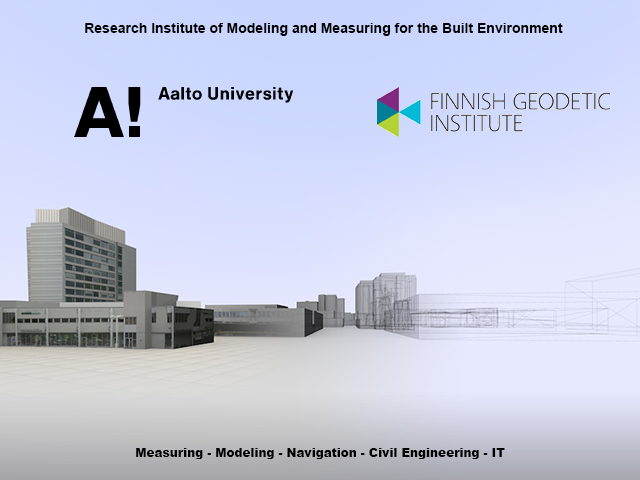 The Research Institute of Modeling and Measuring for the Built Environment was founded in 2007 at the Department of Surveying at TKK (HUT). The Finnish Geodetic Institute is the other partner of the Institute. The consortium is founded for strengthening co-operation between the groups (Civil Engineering and Surveying). The group consists of young, ambitious and skillful scientists. In the field of civil engineering and surveying, they belong to the most productive scientists in Europe (more than 100 refereed papers have been written in the related topics during the 2000s). The group is well linked to international activities having more than 50 international partners in their past and current important trusteeships in ISPRS and EuroSDR. In September 2007, applicants also hosted the ISPRS Workshop on Laser Scanning – Silvilaser 2007, in TKK Dipoli (200 international participants) having topics such as: 3D data acquisition, navigation knowledge, data handling, software development and road and traffic engineering, real estate studies and construction quality. Laser scanning is one of the competitive areas of the Institute. The group has also contributed more than 10 patents or pending patents.